Still no Team Hahn Racing MAN TGS Euro Racing Truck in sight. Does anyone happens to know the wheelsize on the MAN TGS? No idea on wheel size, modelsport have some info here. Manual is available for download now.. I was also curious about the wheels and tyres, that manual hasn't really helped though! It shows the same part number (51588) for the wheels (x4) and the tyres (x2) which is odd. Perhaps a typo? Interesting... I was half-expecting this to be some kind of hoax! Will be interesting to see if there's a resurgence of interest in truck racing. 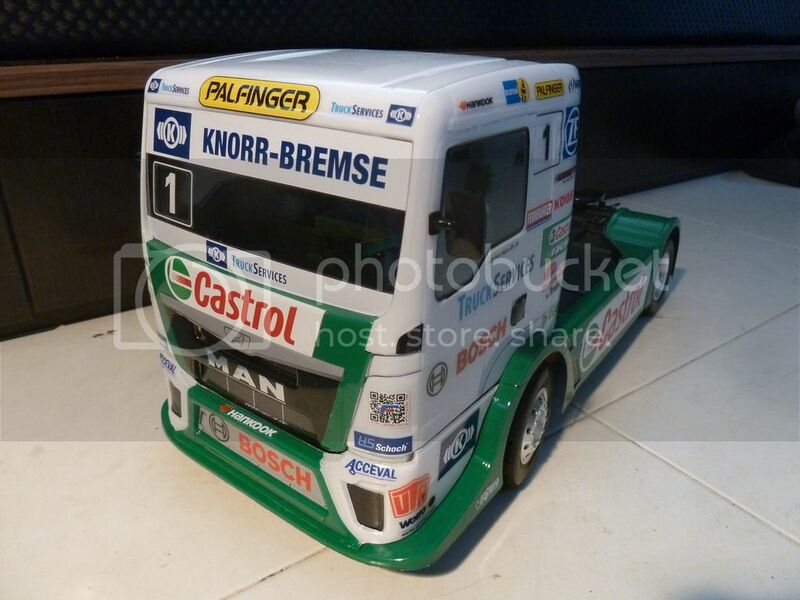 Is it wrong that my thought process was how cool it would look once the truck has had some damage - seeing as the bumper and cab are separate pieces it could look rather realistic! One of the biggest surprises to me is this kit is released on a TT01E chassis, not a TT02. I thought the TT02 replaced the TT01E. I had this conversation at my race club last week, nobody could explain it. Did the TT01E have different wheelbase options to the TT02? Maybe the truck wheelbase worked better on the E. Also may be something to do with the offset of those wheels not fitting over the 02 hubs? This is pure guesswork, I don't have both side-by-side to compare. I suppose the one benefit of getting a TT01E chassis is the internal diff gears will be metal instead of plastic, but the center prop shaft will need to be upgraded to eliminate chatter with hotter motors. The body set instructions do say the body can be used with either TT01 or TT02 chassis. I can't find any info on the tires and wheels other than what looks like a new part number, 51588. Just in time for Fathers day, I knew there was a good reason for having kids! Hobby Company have down as been delivered to them, on the 5th June. I expect to have them around 8th June. That looks awesome! I need to get one of these soon. Alas, a racing truck would not be a good fit in my fleet, so for now I will pass... you know, until I justify it! I wish this was a true tenth scale model. Such a thing would surely be a most impressive sight! Finally, I got my hands on a set of tires and can now inform you guys that the Team Hahn Racing Truck tyre fit M-chassis wheels perfectly. Bonus info: Some time ago, I did have an Tamiya Tam-Tech Hornet buggy and fitted the buggy with M-chassis rear tires, thus the Truck tyre does also fit Tam-Tech rear wheels. Another bonus to this truck, is that the box is printed "Racing Truck" and the Team Hahn Man is just a sticker on the box, which implies Tamiya will be making more liveries for this truck, or even better, more truck variants! Almost bought one...until I discovered that the rear axles just uses two wheels instead of four !! Also it's 4WD !....so it's not so realistic...to me !! LOL?! !....if you want realistic - then Tamiya has got them already! -> can install lights, sound, engine vibration - Comes with 3 speeds! That semi trailer is seven shades of awesome! Yeah, I know...and I would buy one - just like the one above - but I'm short on dough ! !